Online searches related to Korea’s presidential election topped two search engines here Tuesday, when the country’s citizens went to the polls. 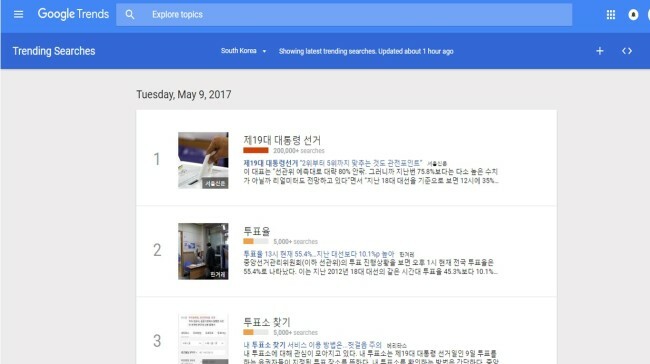 The top seven most popular keywords in Korean on Google Trends -- which tracks the popularity of search terms -- were all related to the election, except for one search term: “A Silent Voice,” a Japanese movie released Tuesday. The most popular was “presidential election,” which saw at least 200,000 searches on the day. It was followed by “election” and “polling place,” which had more than 10,000 searches each. “Vote for Korea” is a website created by a software developer to encourage the public to vote. When a voter submits a photo confirming they voted, they stand a chance to win monetary prizes of up to 5 million won ($4,400). The nation’s largest search engine Naver was also dominated by keywords related to the election. As of 4 p.m., its top 10 most popular keywords were all related to the election.